Following a hitman of a gangster outfit in USA through his assignments to get a specific job done. Like Peter Buchardt I was expecting an action movie starring Brad Pitt and a shotgun. This was not entirely what I got however. 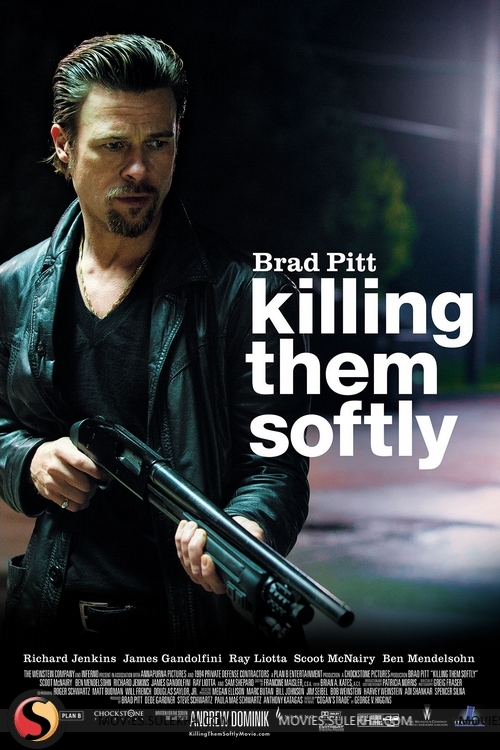 Killing Them Softly is so much more about the dialogue, situations and state of mind of the characters. The shooting and mutilating of people steps into the background and instead you are trying to understand the issues that the characters are facing. Also there is no main bad guy, no one to focus on defeating or rooting against. Instead we are faced with what seems to be every day life for mobsters when some upstart punks think they can rob one of their joints. The idea is great, but in my opinion the execution is not fully satisfying. For this to work you need to be a master of dialogue like Tarantino, and in my opinion Andrew Dominik is not there (yet?). It does however deserve points for trying though. Brad Pitt does an excellent job as always. He is highly believable as an efficient yet humane hitman. James Gandolfini’s part does not make sense to me. He is in a miserable place in his life, but why sink that low? This makes it hard to judge his performance, as I was generally annoyed about how his characters was acting. Scoot McNairy does an alright job playing a dumb robber, and his Aussie friend played by Ben Mendelsohn, is acceptable as well. When you expect an action movie and you get a drama instead, you need it to be very well done. This movie has the intentions, but not the full ability to pull it all the way, in my opinion. From the trailer, from the tagline/plot outline this is definitely not the movie that you expect. In Denmark is sold as rather Hollywood'ish type of movie. There's a lot of focus on Brad Pitt, Guns, Shooting etc. But this is an independent movie, with some famous actors to raise attention. And it does so well. That's not a bad thing. I do not mind at all. I just thought I was in for the same old same old. First of all it very slow paced, which is rare in the majority of gangster movies, but it takes it's time to introduce characters and feature longly conversation, that does relate directly to the plot, but just sets the right mood and let you know people of this universe. This gives me a hint for Tarantino and Guy Ritchie, which is a real good thing. What the film does not have is a main protagonist. Well you can disagree on this, but I'd claim the the movie's plot moves around a few characters and groups of characters and I think it aims to give an insight into or notion of or just telling a story of how a group of criminals in the US can be frustrated about the state of the country... And also just the everyday of these people.